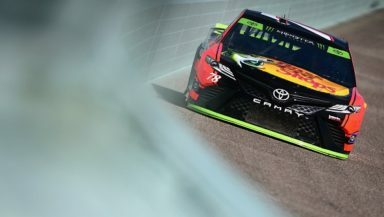 Martin Truex Jr. topped the chart in final Monster Energy NASCAR Cup Series practice at Homestead-Miami Speedway. The driver of the No. 78 Furniture Row Racing Toyota was the fastest with a time of 31.543 and a speed of 171.195 mph. Clint Bowyer was second in his No. 14 Stewart-Haas Racing Ford with a time of 31.804 and a speed of 169.790 mph. Denny Hamlin was third in his No. 11 Joe Gibbs Racing Toyota with a time of 31.807 and a speed of 169.774 mph. Erik Jones was fourth in his No. 77 Furniture Row Toyota with a time of 31.817 and a speed of 169.721 mph. Ryan Blaney rounded out the top-five in his No. 21 Wood Brothers Racing Ford with a time of 31.849 and a speed of 169.550 mph. Kyle Busch, Dale Earnhardt Jr., Matt Kenseth, Kurt Busch and Daniel Suarez rounded out the top-10. Brad Keselowski was 11th and Kevin Harvick rounds out the Playoff drivers in 18th. Kyle Busch posted the fastest 10 consecutive lap average of 164.681 mph.